The Baker Hughes weekly rig count showed a total U.S. increase of 7 to 1,017. It's still 978 lower than the count this week last year. In terms of breakdown, oil rigs were up four, gas rigs were up five and miscellaneous rigs were down two. In the Haynesville area, which includes some other targets, the count was up five, up four in Louisiana and up one in Texas. The table below shows the U.S gas. 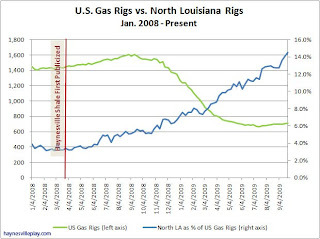 rig count (left axis) versus the North Louisiana rig count (right axis - as a percentage of U.S. gas rig count), showing that North Louisiana represents approximately 14.5% of the gas rigs deployed in the country. In this case I am using North Louisiana as a proxy for the Haynesville Shale because a higher percentage of the area's rigs are dedicated to the Haynesville Play.